Exposed to a wide variety of views and subjects, adolescents seeking truth are challenged to weigh, consider and wonder, “What do I think?” Our educators are experts in their field, providing a dynamic, broad based, academically rigorous and interdisciplinary curriculum. High school teachers balance high expectations with support, guidance and warmth of relationship. Each individual student’s strengths and challenges are met with a holistic understanding of the adolescent and how best to meet their needs. The Class Eight student’s learning journey thus far has been preparing them for the commencement of High School. Class Eight themes explore working with the world’s laws and finding one’s own voice. Students will experience how observation, knowledge and understanding enable them to form appropriate judgements leading to new and interesting questions. The Class Eight curriculum references all that has come before while providing the foundation for the next steps forward. This year appropriately covers the Age of Revolutions through history, science, mathematics and literature, along with a continuing emphasis on the art of communication in both English and Spanish. 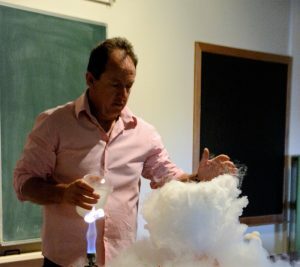 The physics of air, heat and water as well as electromagnetism, the physical laws of the human organism and the chemistry processes of food, enrich the science curriculum. In sewing and gardening, practical usefulness is combined with a sense of the aesthetic. Physical activities, including physical education and Bothmer, develop in the students, fitness, health awareness, strength, social awareness, self- restraint and self- motivation. Artistic subjects include water colour painting, drawing and modelling. High School commences with an orientation camp and later in the year, students participate in a cycling, tenting camp at Kuitpo Forest where a new level of outdoor education skills are employed. Students seek and welcome clarity of explanation in Class Nine. They are encouraged to show interest in the world around them and acquire knowledge and understanding through independent gathering of information. This is also a time when the world seems to present in emotional shades of black and white. Inner balance, structure in their thinking and the ability to make logical, casual deductions based on observation and understanding are developed through the various subjects undertaken. In Class Nine, students collectively seek to answer questions that focus on ‘the what’. What is the world like? What is it made out of? What has happened here? What was it like before now? The history of art Main Lesson explores representation of human consciousness from the Paleolithic era to Ancient Greece. Further studies include the making of the modern world and the world wars, statistics and probability, the geology forces that shape the earth, Australian history, human biology, organic chemistry, geometry, and earth science. In physics, important aspects of human invention are covered, exploring technology and the relationship between machines and humans. Combustion and distillation processes are studied in Chemistry. In English, students explore their personal biography and practice various writing techniques and skills. An understanding for grammar is developed in Spanish lessons. 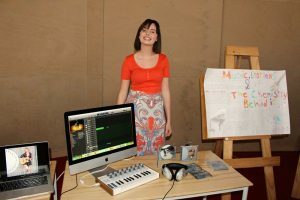 In Music, students study composition and develop practical skills. Horticulture is combined with practical forms of landscaping along with developing a deeper understanding of the environment. The black and white charcoal drawing curriculum meets the student in this year of emotional polarities. Atmospheric mood is explored through tonal shaded drawing, printmaking and photography. In clay modelling, students create utilitarian vessels as well as sculptural, aesthetic forms. Woodwork classes continue to link the raw material with the process and students produce projects that are both beautiful and useful. In sewing, students develop skills in appliqué. Work experience begins in the Primary Industries. In Physical Education students continue developing a range of team games and skills, working with precision and rhythm. 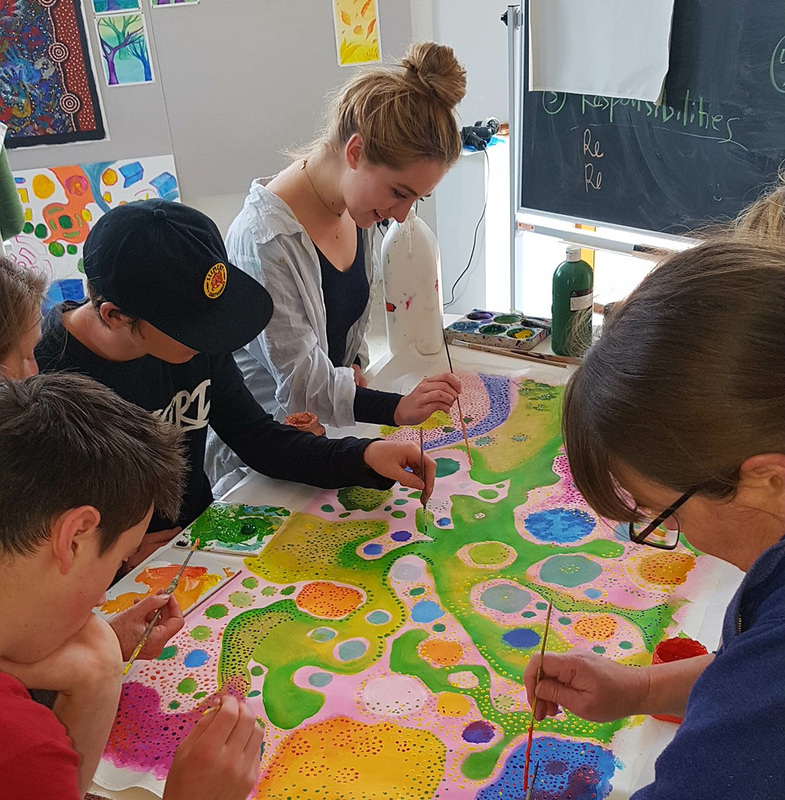 Camping in the Grampians combines geology and rock climbing and another week long camp explores the relationship of place through indigenous perspectives, history, botany, art and geography. 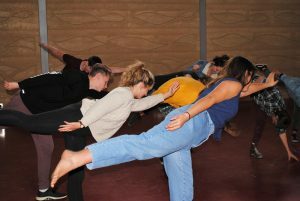 Bothmer continues with students deepening their awareness of the nature of the human being through movement. In Class Ten the students begin to achieve objectivity and clarity in thinking and are able to draw conclusions logically and form common sense judgments. Students sharpen their faculties of comparison, discrimination and discernment. During this year, students are likely more grounded and better suited to ask ‘how?’ They discover that issues and ideas need to be explored from many perspectives before judgments can be made. How does this work? How can I change the result? Mechanics and the laws of force and motion, the art and craft of poetry, the birth of literature, Shakespeare, ancient cultures, salt chemistry, human biology, trigonometry, surveying and the evolution of consciousness are studied. In the History of Art Main Lesson, the cultural evolution of humanity from Ancient Rome to the Renaissance parallels the fundamental shifts of human consciousness. In English students trace the transition from myth to the birth of literature, poetry and language, each studied as living arts. 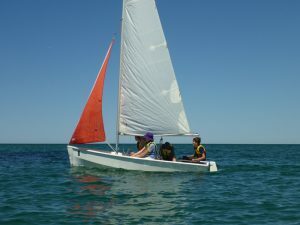 The Outdoor Education program takes students to Yorke Peninsula for the Oceanography and Climatology camp where students become more aware of the Earth as a living organism that responds to interference in its cycles and rhythms. In Mathematics, students experience further work on Trigonometry that can be related to practical experiences in everyday life. Later in the year they travel to Brookman National Park to put their surveying skills to work mapping wombat burrows and contributing their work to scientific research that investigates wombat distribution as a bio-indicator of climate change. Painting concentrates on the development of colour moods. In both painting and drawing, students study works of the great masters. Through clay modelling students represent the human form with particular reference to the torso and head. The polarities of acid and alkali and the crystallization of salts are explored in chemistry. In ICT students engage in a project-based exploration of software. In Woodwork lessons, joints become more complex and larger projects are attempted. Black-smithing allows students to work with moulding materials and to learn metallurgy skills. The music, Spanish, Bothmer gymnastics and physical education programs reflect the development of skills and ask the students to further challenge themselves and apply what they have previously learnt. Students share an inter-school day competing in the Modern Olympics. Work experience takes place in the Secondary Industries. The senior school student graduates to an advanced understanding of the individual’s internal world. The underlying focus of the learning platform shifts the attention to ‘the why?’ Why do I exist? Why do elements work this way? Class 11 studies emphasise the powers of analysis and the ability to discern meaning and purpose. Students undertake a study of Parsival and characters from Shakespearean texts, explore Australian politics and question great philosophers. Specialised subjects include projective geometry, botany, cartography, statistics, ideologies, chemistry elements in the human being, electricity and the history of music. The Botany Main Lesson has practical focus on plant cells and the use of the microscope through to studying major vegetation zones of the world. Botanical water colour painting offers an opportunity for aesthetic responses to the moods and gestures of plant environments. The Parsival Main Lesson poses existential questions about one’s own life path. Global economic relations and the principles underlying them are studied along with the world’s continual need for energy production. Physics, chemistry, studies of society and environment, technology, Bothmer and physical education continue to build and expand on previous learning. Work Experience in the human service field provides the opportunity to experience the act of charity, in providing for others. By the end of Class Eleven, individuals are likely to be more self-directed with a greater sense of responsibility and an increasing capacity for discernment. The outdoor education program takes the students hiking along the Larapinta Trail, forging connections with the natural landscape and indigenous communities. The educational journey culminates with ‘the who’. Who am I? Who do I want to be? By nurturing the powers of synthesis and a capacity for comprehending evolution, the student explores a range of questions on the nature of reality. The Class Twelve student undertakes twelve Main Lessons, including human and artificial intelligence, the history of architecture, Russian literature, optics, the history of modern art, embryology, paleoanthropology, astronomy, Shakespeare, modern world history plus a range of artistic and practical specialist subjects. A major project of self-chosen study is undertaken for three terms and included in the overall year’s assessment of work. This major project is presented to the community at the end of the school year. Class Twelve, hand-drawn, self-portraits are displayed for all to see their strengthening identities as students prepare to step into the wider world. A mid-year, art tour to Melbourne is a highlight of the history of art Main Lesson. Performance across all of these tasks is continuously assessed. There are currently three assessment options for students in Year 12. Each option determines a range of possibilities for future pathways from school. One of these assessment pathways culminates in an ATAR equivalent score supported by SATAC. This enables direct entry to all of the universities in SA and NT. The year concludes with a three-week drama Main Lesson and the performance of the Class Twelve play to the community. Graduations, formals and valedictory dinners provide opportunities to celebrate and acknowledge the transition to life beyond school. Knowing the world, the human being finds oneself and through knowing oneself, the world is revealed.